272 pages | 48 Color Illus. This inspiring and thought-provoking book explores how recent innovations in landscape architecture have uniquely positioned the practice to address complex issues and technologies that affect our built environment. The changing and expanding nature of "landscape" make it more important than ever for landscape architects to seek innovation as a critical component in the forward development of a contemporary profession that merges expansive ideas and applications. 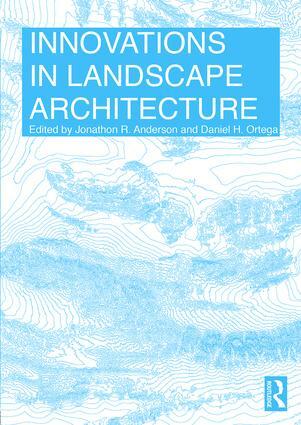 Concluding the book are case studies looking at the work of two landscape firms (PEG and MYKD) and two academic departments (Illinois Institute of Technology and the Rhode Island School of Design), which together show the novel and exciting directions that landscape is already going in. Jonathon R. Anderson is an Assistant Professor of Interior Design at Ryerson University in Toronto, Canada. He holds a Master of Fine Arts in Furniture Design from Savannah College of Art & Design, USA, and a Bachelor of Science with a concentration in Architecture from Southern Illinois University, USA. Jonathon’s work explores how industrial manufacturing and CNC technologies influence the design and making processes. Daniel H. Ortega is an Associate Professor of Landscape Architecture at the University of Nevada, Las Vegas, USA. He holds a Bachelor of Landscape Architecture from the University of Nevada, Las Vegas, and a Master of Landscape Architecture from the Rhode Island School of Design, USA. His scholarly interests lie in the intersection between visual representation and the cultural factors that affect the crafting of our built environment.